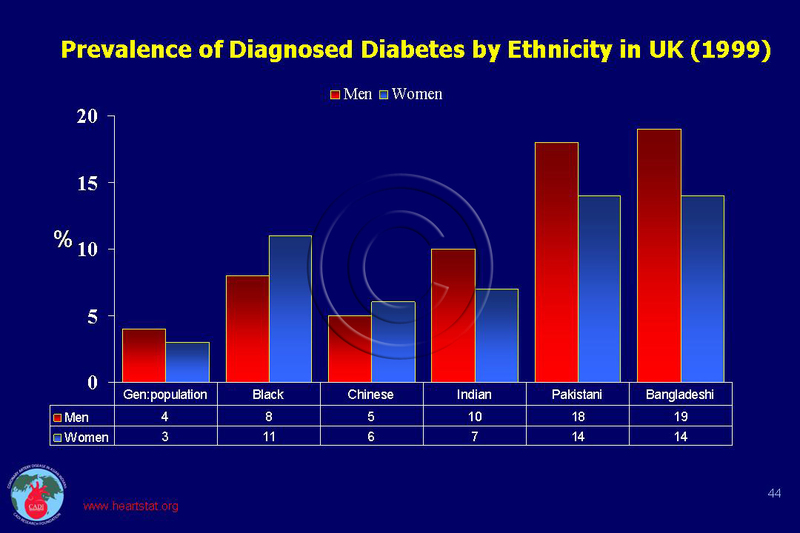 The prevalence of diabetes is particularly high among South Asians (20%) and is 7% among whites and 6% among Chinese. 1. Barnett AH, Dixon AN, Bellary S, et al. Type 2 diabetes and cardiovascular risk in the UK south Asian community. Diabetologia. Oct 2006;49(10):2234-2246. 2. Mather HM, Keen H. The Southall Diabetes Survey: prevalence of known diabetes in Asians and Europeans. Br Med J (Clin Res Ed). 1985;291(6502):1081-1084. 3. McKeigue PM, Ferrie JE, Pierpoint T, Marmot MG. Association of early-onset coronary heart disease in South Asian men with glucose intolerance and hyperinsulinemia. Circulation. 1993;87(1):152-161. 4. McKeigue PM, Shah B, Marmot MG. Relation of central obesity and insulin resistance with high diabetes prevalence and cardiovascular risk in South Asians. Lancet. 1991;337(8738):382-386. 5. Gholap N, Davies M, Patel K, Sattar N, Khunti K. Type 2 diabetes and cardiovascular disease in South Asians. Prim Care Diabetes. Sep 23 2010. 6. Unwin N, Alberti KG, Bhopal R, Harland J, Watson W, White M. Comparison of the current WHO and new ADA criteria for the diagnosis of diabetes mellitus in three ethnic groups in the UK. American Diabetes Association. Diabet Med. 1998;15(7):554-557. 7. www.heartstats.org. CHD Statistics. Mortality. 2011. Accessed July 15, 2011. 8. Aarabi M, Jackson PR. Coronary risk in South Asians: role of ethnicity and blood sugar. Eur J Cardiovasc Prev Rehabil. Oct 2004;11(5):389-393. 9. Yajnik CS, Yudkin JS. The Y-Y paradox. Lancet. Jan 10 2004;363(9403):163. 10. Misra A , Chowbey P, Makkar B. Consensus statement for diagnosis of obesity, abdominal obesity, and metabolic syndrome, for Asian Indians and recomendations for physical activity, medical and surgical management. JAPI. 2009;57:163-170. 11. Ramachandran A, Snehalatha C, Dharmaraj D, Viswanathan M. Prevalence of glucose intolerance in Asian Indians. Urban-rural difference and significance of upper body adiposity. Diabetes Care. 1992;15(10):1348-1355. 12. Valsamakis G, Chetty R, Anwar A, Banerjee AK, Barnett A, Kumar S. Association of simple anthropometric measures of obesity with visceral fat and the metabolic syndrome in male Caucasian and Indo-Asian subjects. Diabet Med. Dec 2004;21(12):1339-1345. 13. Mather HM, Chaturvedi N, Fuller JH. Mortality and morbidity from diabetes in South Asians and Europeans: 11- year follow-up of the Southall Diabetes Survey, London, UK. Diabet Med. 1998;15(1):53-59. 14. Swerdlow AJ, Laing SP, Dos Santos Silva I, et al. Mortality of South Asian patients with insulin-treated diabetes mellitus in the United Kingdom: a cohort study. Diabet Med. Aug 2004;21(8):845-851. 15. Forouhi NG, Sattar N, Tillin T, McKeigue PM, Chaturvedi N. Do known risk factors explain the higher coronary heart disease mortality in South Asian compared with European men? Prospective follow-up of the Southall and Brent studies, UK. Diabetologia. Nov 2006;49(11):2580-2588. 16. Bellary S, O’Hare JP, Raymond NT, et al. Premature cardiovascular events and mortality in south Asians with type 2 diabetes in the United Kingdom Asian Diabetes Study – effect of ethnicity on risk. Current medical research and opinion. Aug 2010;26(8):1873-1879. 17. Karter AJ, Ferrara A, Liu JY, Moffet HH, Ackerson LM, Selby JV. Ethnic disparities in diabetic complications in an insured population. Jama. 2002;287(19):2519-2527. 18. UKPDS 32. Ethnicity and cardiovascular disease. The incidence of myocardial infarction in white, South Asian, and Afro-Caribbean patients with type 2 diabetes (U.K. Prospective Diabetes Study 32). Diabetes Care. 1998;21(8):1271-1277. 19. Feltbower RG, Bodansky HJ, McKinney PA, Houghton J, Stephenson CR, Haigh D. Trends in the incidence of childhood diabetes in south Asians and other children in Bradford, UK. Diabet Med. Feb 2002;19(2):162-166.